Bold colors and designs jump off the page with screenprinted Lokta paper featuring gold brush strokes on bright orange paper. Nepalese paper artisans hand-craft Lokta paper out of fibers from the bark of the Lokta bush and then silkscreen eye-catching designs onto the sheet. 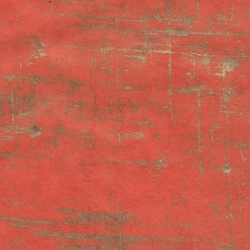 This natural, orange-colored Lokta Paper features brush strokes in a shiny metallic gold covering the sheet from side to side. The paper fibers provide texture and angles for dramatic light effects creating a rich, opulent look. *Image used with permission from Beverly Martin. 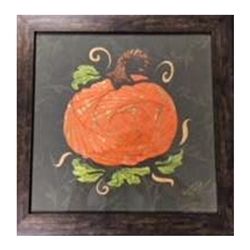 Beverly Martin created this colorful and intricate autumn-themed Iris Fold using handmade Nepalese Lokta Paper!